As of June 2009, how many projects at each repository share URL's? This chart shows the number of projects at each repository that share URL's. Read more about As of June 2009, how many projects at each repository share URL's? As of June 2009, how many projects at each repository share identical short project names? This chart shows the number of projects at each repository that share project names. Read more about As of June 2009, how many projects at each repository share identical short project names? As of June 2009, how have projects in each repository grown by year? 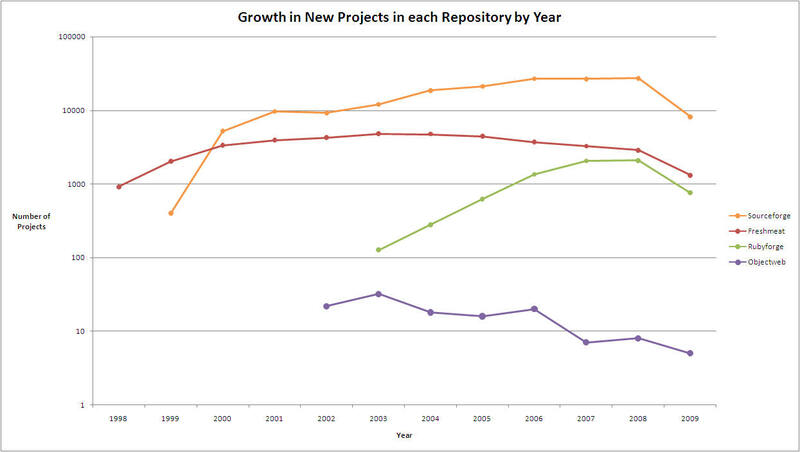 This chart shows the number of NEW projects added to each repository by year. Read more about As of June 2009, how have projects in each repository grown by year? As of June 2009, how many projects are listed in each repository? Read more about As of June 2009, how many projects are listed in each repository?